Blue Rider was very much in touch with what was published in Insignia magazine. Now I don't know if either are still active as I've not had a subscription to Insignia in a long time. However, it did result in some very nice insignia sheets being produced by Blue Rider. 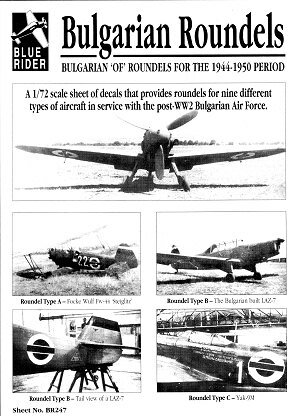 One of them is this sheet on the little-known markings of the Bulgarian Air Force from 1944 to 1950, when they were required by the Soviets to use a star shaped marking. This marking lasted until the breakup of the Soviet Union in 1991/92 and is now a standard roundel. The decals are of similar quality as Modeldecals, which is to say that they are good, but the lighter colors tend to be a bit transparent, as you can see by the dark line where the red intersects the green on the fin stripes. 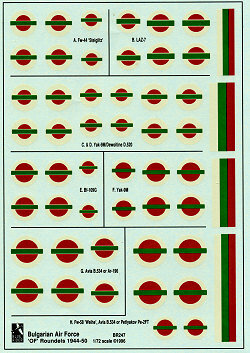 These markings are listed as several 'types' on the instructions and have photos of eight aircraft that used them. Nice as photos may be, it would have been even nice to have had placement drawings. As it is, we have to either guess at some of them or hunt up more reference images. The sheet only offers insignia. Numbers will have to come from elsewhere. The aircraft covered are the Fw-44, LAZ-7, D.520, Yak-9M, Bf-109G, Avia B.534, Ar-196, and Fw-58or Pe2FT. For kits, we have them from a number of manufacturers including KP, Airfix, Italeri and Hasegawa to name a few. Most of these kits are not up to modern standards, but none of them are impossible builds. Thought some of you might be interested.